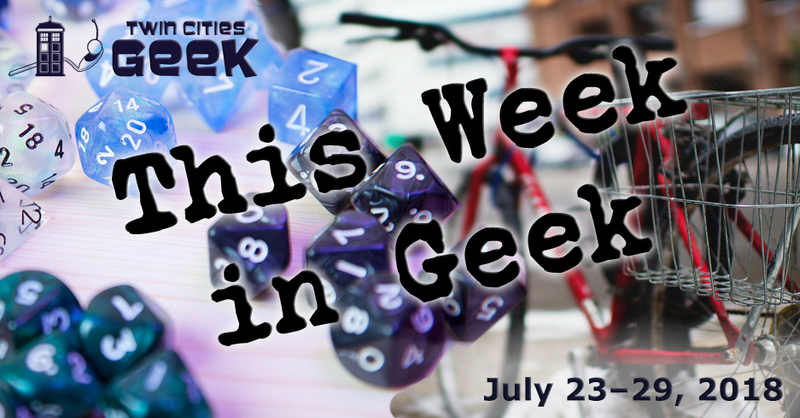 Welcome to This Week in Geek, your guide to events of interest to the Minnesota geek community for the week of Monday, July 23rd to Sunday, July 29th. When: Monday, July 23rd at 6:30 p.m. When: Tuesday, July 24th at 7:00 p.m. Enjoy a night of community and tea with Tea and Meeples, a weekly gathering of friendly geeks at Panda Castle in Richfield. This week, the group will get together for a night of crafting and enjoy a dinner of totchos (tater-tot nachos). When: Tuesday, July 24th at 7:30 p.m.
Come and experience YogaQuest, a blend of yoga and fanfiction storytelling led by certified yoga instructors. Experience a yoga workout experience and a story at the same time. The theme for this week is Transformers, so roll out and develop the flexibility needed to transform into the best robot-in-disguise you can be. This event costs $15. When: Tuesday, July 24th at 8:30 p.m. Enjoy an evening of community and movie magic under the stars! Movies start at dusk and are free and open to the public. Screening this week is Hidden Figures, an award-winning film about the early days of NASA, and the critical contributions of three African-American women to our early space program. It’s an inspiring film about hyper-competent geeks putting in the work, doing the math, and letting humankind achieve the impossible. Check out the complete schedule of screenings this week. When: Wednesday, June 25th at 7:00 p.m.
Join your fellow Whovians and trivia fanatics at the Driftwood Char Bar on Wednesday night for Minnesota’s only regular Doctor Who-themed trivia night, brought to you by the creators of TC Trek Trivia. This is an all-ages event with no cover, so expect seats to go quickly. This month’s theme is “The Missy,” so expect a focus on one of the more interesting regenerations of the Master. When: Thursday, July 26th at 7:00 p.m. When: Thursday, July 26th at 9:00 p.m. Enjoy an evening of community and movie magic under the stars! Movies start at dusk and are free and open to the public. Screening this week is Up, the Academy Award-winning Pixar film best known for its touching and succinct love story, its flying house, the dog with the ability to speak, and its sense of adventure. Also be sure to check the complete schedule of screenings this week. Diversicon is a speculative-fiction convention aimed at helping Minnesota’s SF community more closely reflect Minnesota’s cultural diversity. This event is a project of SF Minnesota, and includes special guests, parties, and more. This year’s guests of honor include Bryan Thao Worra (author, cultural olympian, and president of the Science-Fiction Poetry Association), Ursula Murray Husted (nationally recognized cartoonist, illustrator, and educator), and Charlie Jane Anders (author, founding editor of io9.com, and organizer of Writers with Drinks). Registration is $45 at the door, or $5 for kids ages 5-11. When: Friday, July 27th at 6:00 p.m. When: Friday, July 27th at 7:30 p.m. Gather at the Lake Harriet Bandshell to take in a live concert from local band Dives before a screening of Rian Johnson’s Star Wars: The Last Jedi, the latest chapter in the sequel trilogy which finds the Resistance in a crisis and takes the franchise in new directions. When: Friday, July 27th 8:30 p.m. When: Friday, July 27th and Saturday, July 28th at 11:30 p.m. The Riverview Theater, a neighborhood theater known for affordable second-run cinema, will be continuing its summer late-night programming series with Blue Velvet, David Lynch’s surreal mystery involving a severed ear, a lounge singer, Pabst Blue Ribbon, and young Laura Dern and Kyle MacLachlan pairing up to dig into something dangerous. All tickets are $3, and the theater only takes cash. When: Saturday, July 28th at 9:00 a.m. This show features vendors with new, used, vintage, and rare music, comics, toys, memorabilia, and more. It’s a great show for music, comic, and all kinds of other geeks who enjoy collecting rare and hard-to-find pieces. This event comes three times a year, and always brings cool new stuff, so come check it out! When: Saturday, June 28th at 11:59 p.m. When: Sunday, July 29th at 10:00 a.m. When: Sunday, July 29th at 12:00 p.m. When: Sunday, July 29th at 12:30 p.m. Gender Jam—a meetup group for trans, gender-nonconforming, questioning, and intersex youth—will be meeting up for an afternoon of community and fun. This week, Gender Jam will be taking a field trip to Dreamers Vault Games in Minneapolis for an afternoon of video games, tabletop gaming, comics, and more! Meet at the Exchange at 12:30 sharp for a ride over, or meet the group at Dreamers Vault at 1:00 p.m. As always, bring your permission slip if you are under 18.